Insisting that she was not upstaging the official GOP response to President Obama's State of the Union, Rep. Michele Bachmann (R-MN) offered a combative and highly misleading speech of her own following the president's address. In her "Tea Party Response," Bachmann repeated a litany of false right-wing talking points about everything from the Recovery Act and job losses to the debt and "16,500 IRS agents." 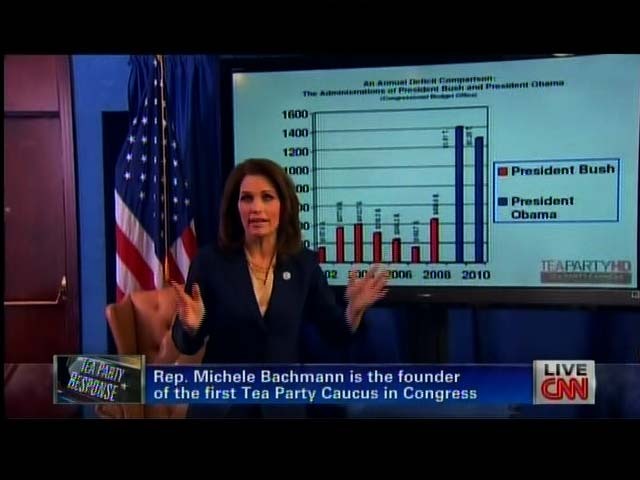 Bachmann: "Failed Stimulus," And Unemployment "Spiked"
BACHMANN: Unfortunately, the President's strategy for recovery was to spend a trillion dollars on a failed stimulus program, fueled by borrowed money.[...] Not only did that plan fail to deliver, but within three months the national jobless rate spiked to 9.4 percent. And sadly, it hasn't been lower for 20 straight months. 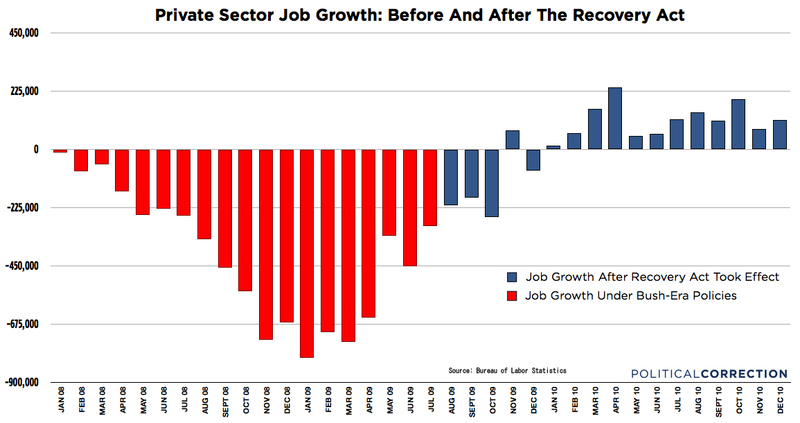 While the government grew, we lost more than 2 million jobs. Let me show you a chart. Here are unemployment rates over the past ten years. In October 2001, our national unemployment rate was at 5.3 percent. In 2008 it was at 6.6 percent. But, just eight months after President Obama promised lower unemployment, that rate spiked to a staggering 10.1 percent. 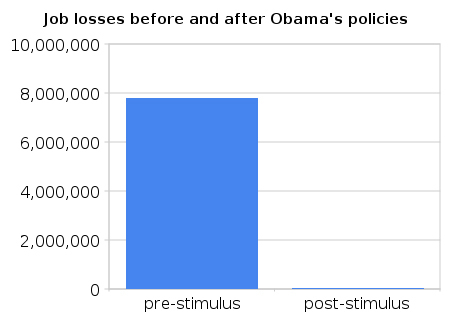 From December 2007 Through July 2009, Economy Lost Nearly 400,000 Private Sector Jobs Per Month On Average. According to Bureau of Labor Statistics data on monthly gains and losses in private sector jobs, the private sector added 23,000 jobs in December 2007. In June 2009, the sixth month of the Obama presidency, the private sector shed 452,000 jobs. Over that 19-month span, the private sector shed 393,000 jobs per month on average, the data show. The private sector jobs-per-month chart below, based on Bureau of Labor Statistics data, is shaded red for months before economists say President Obama's policies began to impact the economy, and blue for subsequent months. 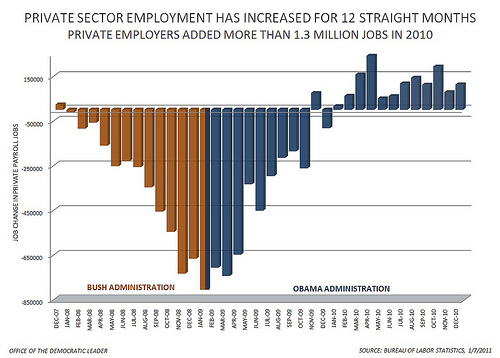 Private Sector Grew By 1.3 MILLION Jobs In 2010. Below is a graph prepared by Minority Leader Pelosi's office showing net private sector job gains or losses per month since December 2007. BACHMANN: But, instead of cutting, we saw an unprecedented explosion of government spending and debt, unlike anything we have seen in the history of our country. 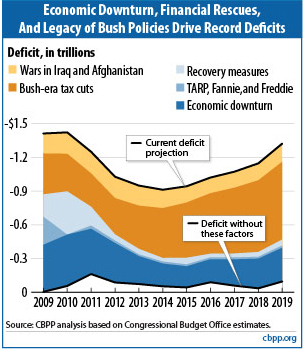 Deficits were unacceptably high under President Bush, but they exploded under President Obama's direction, growing the national debt by an astounding $3.1 trillion-dollars. BACHMANN: What did we buy? Instead of a leaner, smarter government, we bought a bureaucracy that tells us which light bulbs to buy, and which will put 16,500 IRS agents in charge of policing President Obama's healthcare bill. Q: Will the IRS hire 16,500 new agents to enforce the health care law? 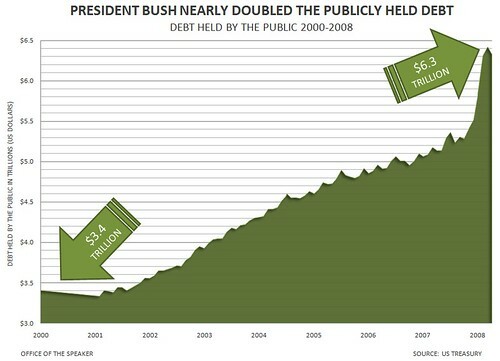 This figure originated with a report put out by Republicans on the House Ways and Means Committee on March 18...The analysts based their 16,500 figure on an assumption that the IRS budget "could" require an additional $10 billion over the next 10 years as a result of the law, a figure they attribute to the Congressional Budget Office...The GOP analysts then inflated their estimate by making a couple of false assumptions. No desks? First, they assume that all the new "administrative" spending projected by CBO would go for payroll and benefits - without any allowance for desks, computers, office rent, utilities, travel or other overhead costs necessary to run any government enterprise. The partisan analysts simply divided the spending (which they figured could be $1.5 billion per year once the law is fully effective) by the current average payroll cost for the entire IRS workforce...The GOP analysts then inflated their estimate by making a couple of false assumptions. Bachmann: Repeal Affordable Care Act, Or "Be Forced To Rely On Government-Run Coverage"
BACHMANN: In the end, unless we fully repeal ObamaCare, a nation that currently enjoys the world's best healthcare may be forced to rely on government-run coverage that will have a devastating impact on our national debt for generations to come. • Employers will continue to provide health insurance to the majority of Americans through private insurance companies. • Contrary to the claim, more people will get private health coverage. The law sets up "exchanges" where private insurers will compete to provide coverage to people who don't have it. • The government will not seize control of hospitals or nationalize doctors. • The law does not include the public option, a government-run insurance plan that would have competed with private insurers. BACHMANN: And, the President should repeal ObamaCare and support free market solutions like medical malpractice reform and allow all Americans to buy any healthcare policy they like anywhere in the United States. Under the earlier proposals, insurers could sell coverage to residents of any state, with the insurer complying with insurance regulations in the state in which the company was based, instead of the regulations of the state in which the consumer lived. Several researchers analyzed these proposals within the context in which they had been proposed-that is, without other insurance market reforms or significant subsidization of coverage for the low-income population. BACHMANN: We need to start making things again in this country. And we can do that by reducing the tax and regulatory burden on job creators. 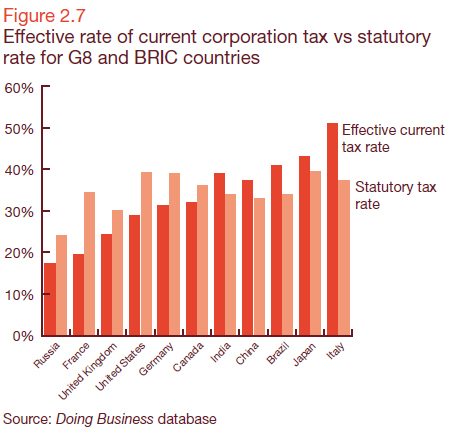 America will have the highest corporate tax rate in the world. Think about that. Over the years, a parade of lobbyists has rigged the tax code to benefit particular companies and industries. Those with accountants or lawyers to work the system can end up paying no taxes at all. But all the rest are hit with one of the highest corporate tax rates in the world. It makes no sense, and it has to change. As noted in Chapter 1, reducing the statutory rate of corporate income tax has been the most popular government tax reform in the period. However in most of the economies, the case study company does not pay corporate income tax at the statutory rate on its profit before tax, since the tax rules require adjustments to be made to this in order to calculate taxable profits. A common example is to substitute tax depreciation for commercial amortisation of assets.